At GL RFCA we champion London’s Reserve Forces’ and Cadets’ through community and corporate engagement, estate management and support to local Reserve Units and Cadet Detachments. Reservists are an integral part of the Armed Forces, working side-by-side with their regular colleagues at home and overseas. 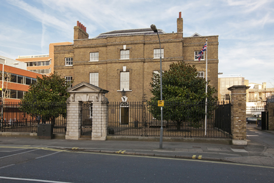 Based in its beautiful Georgian offices a stone’s throw from Putney Bridge tube station, the staff of GL RFCA are Crown Servants headed up by a diverse workforce of civilians, reservists and ex-regulars. The organisation is also responsible for over 30 staff who work directly supporting 14,000 Cadets in four London sectors. We employ specialists in estate management, working with young people, employer and community engagement, commercial lettings, communications, and administrative support. As a small, diverse team we have plenty of opportunities to support colleagues working outside our area of expertise with the opportunity to learn new skills. We also get to work with and for thousands of London's brilliant Reservists and fantastic Cadets.